I would like to thank all of my wonderful friends back in South Africa who thought of me on my birthday and to my wonderful family: Ouma, Oupa, Layne, Shared, Britney - you guys are the best! My birthday went well. I kind of got to have to for two days. How many people can say that? Because my birthday fell on a Sunday, Ben decided that Saturday was a good day to celebrate it. He made me breakfast in bed - bacon and eggs, might I add! Then that night Layne came over. We had a wonderful braai. Ben brought out a 'insta' cake that he bought from Cold Stone - can you guess what kind of cake it was? I had my first ice-cream cake! And was it so delicious! Then we played Monopoly all night - that is what Ben got me for my birthday. Sunday I got calls from my family far away and emails from friends in South Africa. Then we had a relaxing day. It was just so perfect. Thanks Honey for making my birthday magical, you top yourself every year! Here are some pictures from that great day. Sorry, I never got a picture of Layne. I was going to, but remembered to late. The other day I was talking with Ouma and I told her about what Cynthia is getting up to in her little adventurous life. I told her that I could not keep her busy. Cynthia is just way to active to play with any of her toys or play much by herself. So Ouma gave me some golden advise. Let her play in the pots cupboard or with all the tupperwares. So I gave her the pots cupboard. And oh, we have hours of fun right there! Ouma you are a genius! 2. Cynthia thought it was only nap time when she was put to bed last night. 3. We went to Target to buy my birthday present from Layne. 4. I did some extra credit for Ben in one of his classes. 5. I was Ben’s open book for an open book quiz he had to do. 6. I chatted with Ouma on MSN. 7. Cynthia would not finish her food. 8. Cynthia learnt to speed crawl – and it is so funny. All those who feel the need to share something about themselves. 1. I love the snow, but don’t like the cold. I love the sun, but hate it when it gets to hot (hot is uncomfortable). I would prefer to be cold because you can put lots and lots on, when you are hot, you can only take so much off and still be decent. 2. I do not believe that any one should get up before the sun. 3. I absolutely love being a mom. Cynthia is the apple of my eye. 4. I love to learn new things. 5. I used to think that I had a creative eye. Then I married Ben. Now everything I do, I get corrected. 6. I hate Spiders and since last night, octopuses scare me as well – Thanks Ben! And octopus is just a spider that lives in water. 7. I hate licking the seal on envelopes. It is just all round icky – taste, texture. 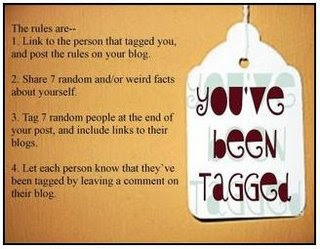 I tag those who would like to share some random things about themselves. Happy turkey day to all you Canadians!!!! She cried and then survived it like a pro. Her bruise when all different shades. Yellow, brown, pink, purple, blue. She has healed from it now, but it looked so bad from a few weeks. Cynthia is EXTREMELY talented at getting what she wants. She loves to look out the window. The other night we were sitting on the couch. Cynthia was unpacking the game and puzzle shelf like she loves to do. The next thing we know, she is sitting on the couch with us. Then we look at her again and she is sitting on top of the couch. By the time I got up and got the camera, she was standing on the top of the couch looking out of the window. Upon analyzing how she climbed the couch... Well she moved the puzzles and games to the couch and used them as a ladder. We are going have our hands full when she gets into her twos. This is the couch. It gives you an idea of the distance she needs to climb. We bought Cynthia her first pumpkin a few weeks ago. I am not sure how she enjoyed not being able to eat it, but she had fun trying to. She helped Mom and Dad scrape out the middle and promptly put it in her month. She had a great time. She was so wound up from playing with the pumpkin that her bath afterwards just added to the excitement and she never slept. Here are some cute pictures of your to enjoy. ... October? Last week the weather man said that there would be snow this weekend. I said yeah right! Since when are the weather men correct? Apparently this time, when I doubted them. So this morning, this is what we woke up to. Cynthia was not sure what to make of this stuff. This morning when we were going to the car to leave for church, we stopped and let her check out what this fluffy white stuff was. She tasted some and then stuck her tongue out of her month - like a puppy. It was funny. The rest of the way to the car, she had her tongue out her month. She is such a little character. Well, to sum things up. I am in the mood for Christmas and disappointed that Halloween never came. Baby Bear is such a character that is in her own bubble. Check out this little personality.